Office stools, also known as drafting stools come in many different styles and heights. Office stools are often used instead of chairs for several different reasons. The seats come in many different shapes and styles, and are usually very ergonomic and comfortable. Some stools are made to distribute body weight evenly and some are flat and cushioned, while some are saddle seats designed for long term use. Many companies and offices require employees to sit at a draft table for long periods of time in order to design, illustrate, etc. Office stools are ideal for this because of the ability to adequately move around during the designing process at the table, and for the comfort and support that the stool will provide. Settings for the foot rest will also allow the person to sit on the office stool and have total comfort and movability during their work process. Breathable mesh and other lightweight materials will keep you cooler if you happen to be in a warmer climate. Some office stools are made with thicker padding for comfort when sitting for long periods of time. A good office stool requires a good sturdy base. 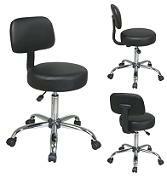 Office stools can be purchased with easy wheels that work on carpet, as well. These will allow the user to be able to move around their workplace with ease. Contact us today to place your order or to speak to one of our sales associates to answer any questions you may have. We offer free shipping on every order and the ability to order your office computer chairs right online!